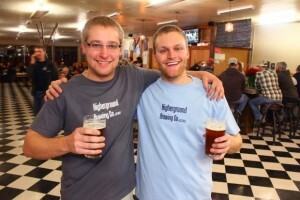 About – Higherground Brewing Co.
To become the youngest brewery owners and head brewer in the state, you have to dream big. And for two homegrown Hamilton boys, reaching for the stars means getting back to their roots. Miller, along with his oldest friend Fenn Nelson, officially opened the doors to Higherground Brewing Co. last week to packed houses each night. Both just 24 years old, Miller and Nelson spent four and a half months renovating the old Grocery Emporium on U.S. Highway 93 in Hamilton into the Bitterroot’s newest taproom. Hamilton wasn’t always the top spot in their mind. But with their families, friends and community support centered in the hub of the Bitterroot Valley, it seemed like the perfect place to get a start. Teaming up to open their own brewery was only natural for the two, who have known each other since kindergarten. Nelson graduated from the University of Montana with a degree in business finance and economics. Miller earned his bachelor’s in microbiology. However, after college, both Nelson and Miller found themselves in less-than-ideal jobs. Nelson worked for UPS and Miller painted houses in Colorado. “We wanted to do something with our degrees,” Nelson said. Nelson worked out the business plan, getting assistance from the Montana Community Development Corporation. Miller is the head brewer. He earned an international brewing diploma following a six-month program at UC Davis. He’s been home brewing since college. When he was 21, he entered the Missoula Community Brew homebrew contest with a Scotch ale, beating out “all those old beer guys.” That’s when he knew he was on to something. That Scotch ale will be one of six of Higherground’s mainstay brews along with Dry Fly IPA, Clearwater Crystal Ale, Waist Deep Wheat hefeweizen, Flash Flood Milk Stout and Base Camp Irish Red. The crystal ale has been an early favorite, Miller reported. It is the hardest of the group to make, he said, but one he’s very pleased with. “It’s hard to find a microbrewery that brews a light, crisp beer,” he said. Beers are $4 a pint, $9 for growler fills. People wanting to sample some of Higherground’s brews can come into the brewery to get a taste; or keep an eye out in western and central Montana for their canned offerings and draft beers at select restaurants and bars! In addition to great beers, Higherground serves fantastic pizza and salads. Higherground isn’t just about quality beer, though. The brewery also serves wood fired pizzas, handmade on site, as well as salads. They are starting with a simple menu hope to expand in the future, Nelson said. “That way we can keep all of our products high quality,” Nelson said. The building may be one of the more spacious settings for a brewery, holding up to 140 people, but the five-barrel system is one of the smallest brewing systems in the state, Miller said. The bar stands as the brewery’s centerpiece, made of thick concrete the duo poured themselves. They received estimates pricing the 54-foot bar at $10,000. They decided to do the work – spending 36 straight hours in the brewery to get it done – and spent just $400. Sticking with local flavor, colorful paintings by Brendan Stewart from Florence decorate the walls. “It gives you a different vibe when you walk in the door,” Miller said. And two quaking aspen tree trunks stand in the middle of the brewery, which were fallen trees from Nelson’s parent’s property. The trees help visually break up the room and also go along with Higherground’s theme. “The trees are reaching for the roof and we’re reaching for the sky,” Miller said. Looking into the crystal ball, Nelson and Miller will eventually work up to producing seasonal beers to go along with their signature brews, possibly upgrade their brewing system to bottle and sell their beers locally and make the building as energy efficient as possible. 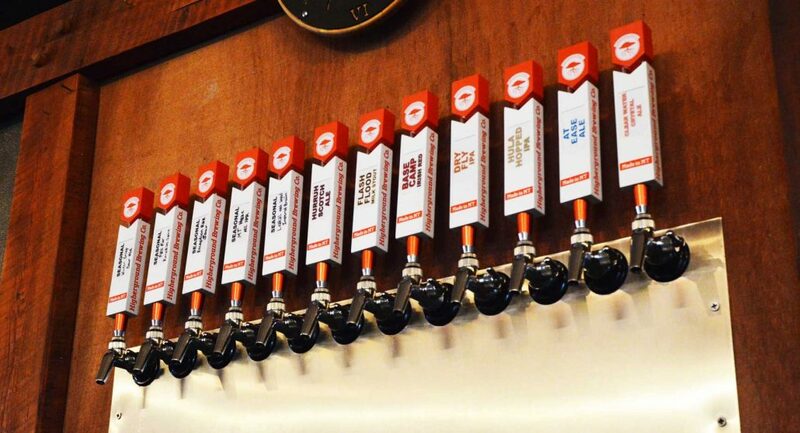 With the addition of Higherground, Bitterroot Valley residents and visitors now have three choices for local brews – Bitter Root Brewing in Hamilton and Blacksmith Brewing in Stevensville.